Dental Education system: There are eighty six public and private universities with twelve Dental colleges in Bangladesh. The BDS course is for five years included one year internship training. The lecture and examinations in English. There are sixty five students admission to each dental college for every year. Presently, in total there are about five thousand dental surgeons in Bangladesh. 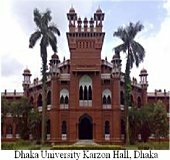 The dental surgeon usually received the practice license (by Bangladesh Medical and Dental council) and university certificate after graduation of university at the same time. History of Bangladesh: In 1947, the partition of India was the partition of British India into two parts on the basis of religious demographics. This led to the creation of the Islamic Republic of Pakistan and the Republic of India. Language movement: The Bengali language movement was a political effort in Bangladesh (then known as East Pakistan), advocating the recognition of the Bengali language as an official language of Pakistan. Such recognition would allow Bengali to be used in government affairs. 1948, the Government of Pakistan ordained Urdu as the sole national language, sparking extensive protests among the Bengali-speaking majority of East Pakistan. The students of the University of Dhaka and other political activists defied the law and organized a protest on 21 February 1952. The movement reached its climax when police killed student demonstrators on that day. After years of conflict, the central government relented and granted official status to the Bengali language in 1956. In 2000, UNESCO declared 21 February International Mother Language Day for the whole world to celebrate and to visit in Shaeed Minar,1 in tribute to the Language Movement and the ethno-linguistic rights of people around the world. Independent Bangladesh: The Bangladesh Liberation War was an armed conflict pitting East Pakistan and India against West Pakistan. The war resulted in the secession of East Pakistan, which became the independent nation of Bangladesh. 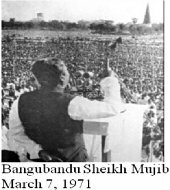 The great leader Sheikh Mujibur Rahman declaring East Pakistan's independence as the state of Bangladesh on 26 March 1971.2 He is popularly referred to as Sheikh Mujib, and with the honorary title of Bangabandhu ( "Friend of Bengal"). Areas and populations: Bangladesh is in South Asia sometimes converging with Southeast Asia, bordering the Bay of Bengal to the south, mostly surrounded by India and bordering Myanmar in the southeast. Presently the total populations are about 16 corer and the areas of Bangladesh are 56000 square miles. Culture and society: Bangladesh is a hierarchical society. People are respected because of their age and position and older people are naturally viewed as wise and are granted respect. Bangladeshis expect the most senior male, by age or position, to make decisions that are in the best interest of the group. This is also valid in businesses, the majority of which will be family owned/run. Religion: The majority (about 95%) of Bangladeshis are Muslim, rest of 5% are Hindu, Buddhist, and Christian. There is a strong tradition of music, dance, and literature that includes classical devotions of Hindu and Muslim music. Festivals: Islam defines many of the festivals in Bangladesh including two one after Ramadan (thirty days fasting) Eid and one after the Hajj Eid and for Hindus Durga Puja and Kali Puja. On the whole an entire community participates in each other's religious ceremonies. Rainy season (June to August): in this season, 70 percent of the land is under water from rivers the sea, rain, tidal waves, floods and the melting snows of the Himalayas. Autumn (September to October): the land turns into a carpet of bright green rice shoots while the smell of drying jute invades the air. Flowers bloom, the rice ripens and the harvest begins. Although the air is humid, there is a slight chill late at night. Late autumn (October to November): during this season, the land is at its luscious best. It marks the start of the wedding season where receptions are held under red, blue, green or white tents. Winter (November to December): from mid-November to early January, the weather becomes more arid and less humid. The earth dries and dust forms. Warm clothes are pulled out. Spring (December to February): the coolest days are from mid-December to February when the days are golden with light, the flowers are blooming and the nights and early mornings are chilly. In this season is suitable for traveling in Bangladesh. Summer (March to May): the weather warms up a bit each day until March 1, when the heat starts intensifying more rapidly. The soil turns a dusty khaki and then almost white. 2. a b "Civil War Rocks East Pakistan". Associated Press. Daytona Beach, Florida, USA: Daytona Beach Morning Journal, via Google News. 27 March 1971. 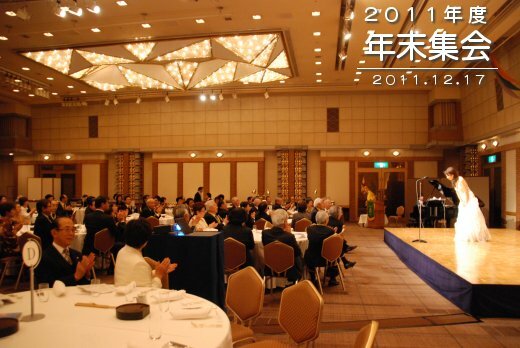 Acknowledgements: I would like to thank Dr. Koji Hashimoto for reviewed this article.